Earning a national credential can help elevate your skill set and take your career in the multifamily industry to the next level. With five Credentials to choose from, there is a Credential out there for everyone. The National Apartment Leasing Professional (NALP) recognizes that leasing professionals are the first people prospective residents meet and are responsible for generating traffic, conducting leasing demonstrations, overcoming objections and qualifying prospective residents. This program teaches all these skills and more. The Certificate for Apartment Maintenance Technician (CAMT) acts as an introduction for new maintenance professionals or as a refresher for the veteran employee, teaching what it takes to run a cost-effective maintenance program. The Certified Apartment Supplier (CAS) helps Supplier’s gain insight so they can better position their products and services to meet industry needs. The Certified Apartment Manager (CAM) helps Assistant and Community Managers enhance their skills, knowledge, and ability to effectively manage an apartment community and achieve its owners’ investment goals. Finally, the Certified Apartment Portfolio Supervisor (CAPS) emphasizes recruiting, retaining and engaging high-performing employees in addition to analyzing and report property and portfolio financial results, conduct due diligence and community takeovers and oversee management agreement. Earlier this year, Chris Lopez, Portfolio Manager at Round Hill Pacific, earned his fourth and final on-site national Credential by earning his CAMT. 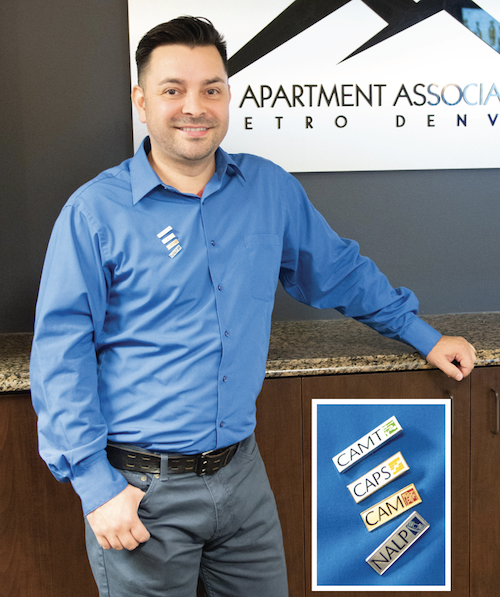 Chris is the first multifamily professional in Colorado to have obtained and maintained all four National Apartment Association Education Institute Credentials. Lisa Godbehere, Director of Education and Career Development at AAMD, sat down with Chris to talk about his career in multifamily and why earning these Credentials were so important to him. In 2010, Chris was offered the Assistant Portfolio Manager position with Round Hill Pacific where he helped oversee 14 properties and a total of 395 units. He has been with the company for eight years and recently accepted a promotion to Portfolio Manager. Chris earned his CAPS credential in 2016 and completed his four on-site Credentials with CAMT earlier in 2018. Three of the four Credentials earned by Chris were paid for by his management company at the time, but he paid for his CAMT personally. He has never worked on the maintenance side of the industry and said “I wanted to earn my fourth Credential as well as gaining an insight to a day in life of our maintenance staff to learn where they are coming from. It takes both the office staff and maintenance to run our communities.” In addition, Chris attributes CAMT to providing him with the tools and knowledge to help talk to residents about maintenance issues. in-depth knowledge of the industry that isn’t always offered on-site, especially with the day-to-day stuff. It’s extremely beneficial.” Chris hopes to continue his career in Multifamily and is always looking for more opportunities to grow personally and professionally.